Divine Fortune is a five reel and 20 paylines progressive video slot powered by Net Entertainment. Main theme of the slot is antic greece and its mythology with ancient greek inspried music playing on background. High pay symbols on the reels include Medusa, Nemean Lion, Minotaur, Phoenix and while low paying symbols are greek-style playing cards (A, K, Q and J). Pegasus is the wild symbol and it can be used as a substitute for any other symbol to complete a winning combo. Pegasus symbol can’t be used for Free Spins and Bonus symbols. Give Divine Fortune slot a spin here for free or visit any of the other NetEnt Casinos like Calvin Casino, Cashmio Casino, Loki Casino and others to play for real money. Before games starts, players need to place bets. “Coin Value” ranges from 0.01 to 0.5. “Level” button is for adjusting number of coins per line. For biggest bet value use “Max Bet”. While using “Autoplay” player can choose number of spin will be played automatically and to start the game just click “Spin”. Players can find four main bonus features that Divine Fortune provides. Falling Wilds Re-Spins feature can be activated when the Wild symbol lands on any position. Number of re-spins depends where the Pegeasus symbol has landed. As soon as 1 re-spin ends, Pegasus shifts down 1 position. This feature will go on until all Wilds disappear from the reels. Wild on Wild is a second feature. It is similar to the first feature with the small twist, it is triggered once the Wild lands behind the Falling Wild feature. Then Wild symbol will expand covering whole reel awarding player bigger payout. Third feature are Free Spins. When Scatter symbol lands on 3, 4, or 5 reels simultaneously, player will awarded with Free Spins. And last feature is a Jackpot Bonus. During game players will collect gold coin and when 3 or more bonus symbols are collected this feature will be activated. Each bonus symbol can give players a win of between 10 and 200 times as well as, player will begin with 3 spins and the number of spins resets to 3 if a Bonus symbol lands on the reels. 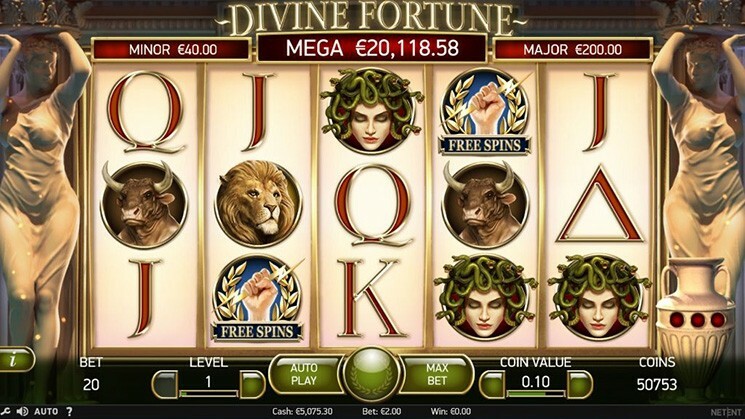 In the end, Divine Fortune slot is good-looking video slot that can provide players with big payouts.